The Varsity wears this Nike Dry-Fit performance knit warm-up tee before all games. Player's number on back. ST CHARLES along back bottom hem. Inner drawstring elastic waistband for a custom fit. Vented hems give you room to move. Small inner pocket. Hooded half-zip Nike lightweight jacket. on back, player number on left chest. Lightweight, lined Nike poly pants feature elastic waist with drawcord, side pockets. all games. Player's name and number are printed on back. Add number to back for extra $4. This poly performance lightweight knit has a front pouch pocket, contrasting piping for style and moisture-wicking material for comfort. It's a classic! This sturdy and reliable addition to any wardrobe makes a bold, spirited statement. Front pouch picket, drawstring hood. Available in either orange or royal. A very popular take on the classic hoodie. 90/10 cotton/poly blend with Spandex trim and a front pouch pocket. Back design standard with optional number on front left chest. 94/6 poly/spandex performance tee wicks away moisture and is anti-microbial too! 94/6 poly/spandex performance tee wicks away moisture and is anti-microbial too! A great workout shirt! It's also a great workout shirt, with its 94/6 poly/spandex performance poly material that wicks away the wet. The heavyweight long-sleeved tee is a comfortable and classic part of any spiritwear collection. The mainstay of any spiritiwear collection: our heavyweight short-sleeved tee. This performance knit sport shirt features breathable dry-fit material to keep you cool, piping to keep you stylish. Our sweatpants come in a 50/50 cotton blend (left) and a poly performance knit (right). Both have side pockets and open leg bottom. Sizing chart at online shopping cart. Waterproof and windproof, warm yet lightweight. Front full zipper, dual pockets, adjustable bottom with shockcord. Wind-resistant microfleece with Dry-Excel features, a half-zipper and white piping detailing. Small but standout Club logo completes the look. Full zip, hooded nylon with sweatshirt lining. Wind- and water-resistant. Adjustable hood and bottom. Inside valuables pocket, front zippered pockets. Half-zip pullover jacket with contrasting white panels and trim. 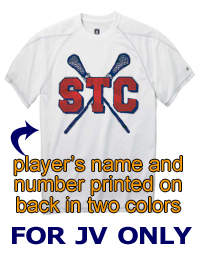 Optional Player number on left chest, St Charles Lacrosse across full back.